West Ham manager Slaven Bilic went all emotional on us at the weekend. 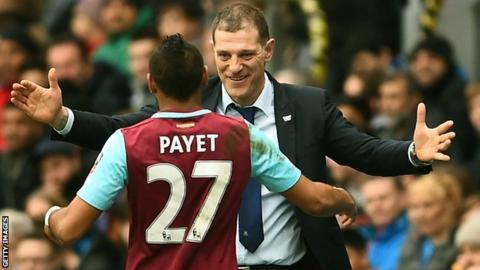 "I have to get poetry lessons to describe his importance to us," he said of Hammers midfielder Dimitri Payet, who orchestrated their 5-1 victory over Blackburn in the FA Cup fifth round. So we asked you to get involved on social media by sending in your prose, dedicated to your favourite clubs and players. Oh, football. What happened to you? Football, oh football. What happened to you? You're just not the game as a kiddy I knew. Now with players on wages that could fund a small city, yet desire has lessened which seems such a pity. No respect for officials and cheating abound. A small puff of wind sends a player to ground. Our children are watching what these fellas do. They think they are heroes, they haven't a clue. I really do think it's time for a shake up, and all of the top folks now need to wake up. I want players to think of the badge not the pay, before the sport I once loved starts to slowly ebb away. By Chris Greenhouse: Gabby Agbonlahor: Yes, he can score. He's done it before, but it happens no more. Someone show him the door. By Steve Brunskill: Roses are red, I'm useless at poetry, but we've got Payet...so I don't care. James Norling: LVG and United are on the brink. I've had more fun unblocking the sink. Let's hope they play well tonight, for Shrewsbury Town will show their might. If we shall succumb and lose, LVG leaving will be all the news. Andy Harris: Sergio Aguero a world class act, the best in the league and that's a fact. Unlike Yaya you never hear him moan, he can play with a partner or can be deadly alone. They once fed a goat and then he would score, now we have an Argentine that the whole club adores. With the ball at his feet he tears defences apart, his goals aren't like sport they are more like an art.